William Jennings Bryan "Billy" Herman (July 7, 1909 – September 5, 1992) was an American second baseman and manager in Major League Baseball (MLB) during the 1930s and 1940s. 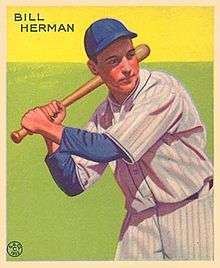 Known for his stellar defense and consistent batting, Herman still holds many National League (NL) defensive records for second basemen and was inducted into the National Baseball Hall of Fame in 1975. Herman's granddaughter is Cheri Daniels, wife of former Indiana Governor Mitch Daniels. ↑ Mackin, Bob, "The Unofficial Guide to Baseball's Most Unusual Records", Greystone Books, 2004. ↑ "Billy Herman, 83; Ex-Cub and Dodger Was Hall of Famer". The New York Times. September 7, 1992. Retrieved October 30, 2013.